What Happens Underground - Collage, 6x6"
A lot happens underground, especially when it comes to garden beds that are enriched with compost. I can see what happens on top of the ground, which is teeming with life. The cabbage loopers, crickets, and even the occasional earthworm that surfaces. Since I don’t use chemicals for pest control, I have to hope they control each other. Underground is another story. I know we have plenty of earthworms doing their work to enrich the soil. I’m not sure I want to picture what else is under there. Today I had to water once in the morning and again in the late afternoon. The new fall temperatures are wonderful, but it’s also sunny, windy and dry. So my new plantings will need to be pampered for the next few days. They’re looking great. 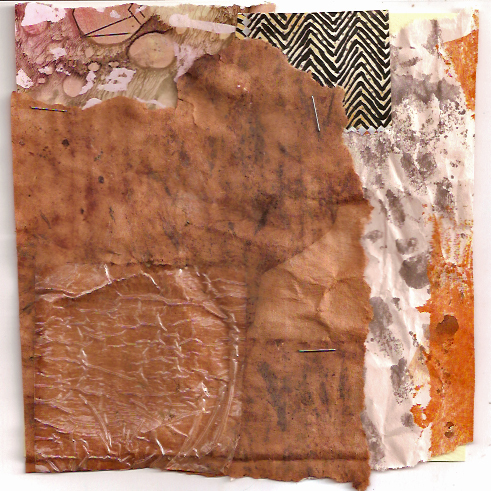 This collage incorporates hand painted papers and also weathered and buried papers. The big brown piece is part of a corrugated box that was out on my compost pile for a few months. In the upper left hand corner is a little snippet of Citra Solv paper from a National Geographic magazine. ← Lettuce and Broccoli and Cauliflower, Oh My! Thank you, Margaret. That’s good to know.